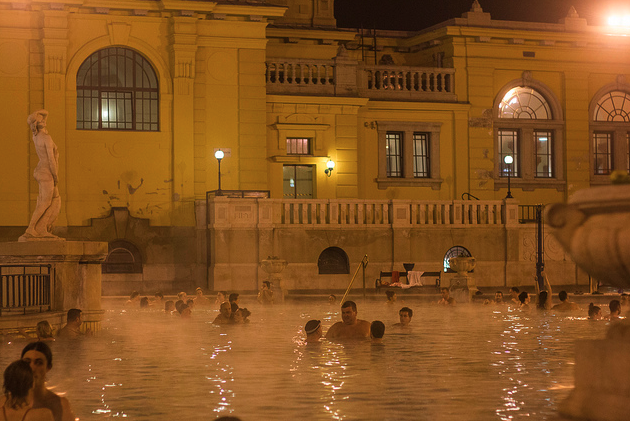 Szechenyi Bath is open all days in March, even on March 15, the historical national holiday in Budapest (when shops and some attractions are closed). Szechenyi Bath has the regular opening times in March, with the exception of March 15, which is a public holiday in Hungary. On March 15 the opening hours are the weekend opening hours and the Szechenyi ticket prices are the weekend ticket prices. Exceptions: national holidays when the bath is open as on weekends or for shorter hours (see below). There are more events taking place in March in Szechenyi Bath and in the thermal baths of Budapest. 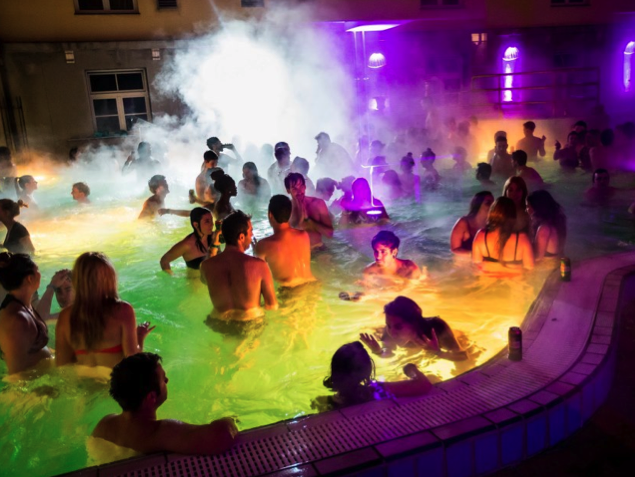 The Night of Baths Festival in Budapest is a yearly fun festival when many of the thermal baths of Budapest open their gates for a late night bath party at a discount price. The bath festival programs include shows and disco parties. You can go from one bath to the other with a single entrance fee covering the costs for all baths. Attending the Night of Baths Festival is a nice way to see how characteristic each bath is in Budapest, as each has its historical background, different architecture and atmosphere. Some call it bath hopping, which is a perfect definition. So come bath hopping to Budapest, and feel the pleasures of the City of Spas. The Night of Baths Festival 2013 date is very likely March 9, 2013 but the date has not been finalized. In March the Magic Bath parties in Budapest will be resumed, and continue to run until the end of May. The winter bath party series called Magic Bath party started in December 2012, and after a recuperation in the January and February months of 2013, we are glad to announce that March Spa Parties are back on track, the Sparty Saturdays will go on. The location of the winter bath parties is not Szechenyi Bath, but the less touristy Lukacs Bath, which is also one of the historical thermal baths in Budapest (there was a Turkish bath in its place in the 16th century, but the present building was erected in the 19th century). We warmly recommend the magic bath parties to anyone who wishes to be part of something special, unique, who love to dance, love natural spring waters, and love to enjoy laser shows and other visual effects connected to electronic music. There is no upper age limit but you must be at least 18 years old to attend the magic bath parties. The bath party has its own buffet where you can buy beers, wines, cocktails, and other drinks, including soft drinks of course (note: 18 is the legal age in Hungary for alcohol consumption). Previous Can I Rent a Bath Robe in Szechenyi Bath?